Dinner dance guests include, from left, Jason Reidel, Frana Sadler, Gorjana Reidel, Brent Martini, Emery Brett Ledger and Alison Ledger. Photo by Blue Sky’s Studio. 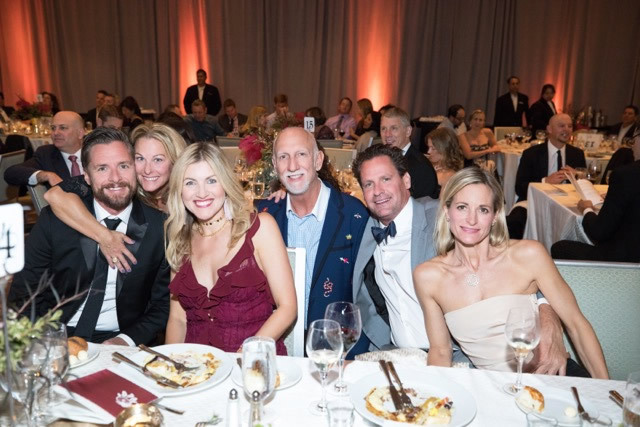 Catching Dreams, the theme of the SchoolPower annual dinner dance, grossed over $320,000 to support academics, music and the arts in Laguna Beach schools. About $185,000 of the proceeds will go towards the annual fund-a-need. This year, that goal involves the hiring of a district-wide digital library specialist as well as part-time teacher coaches, said a SchoolPower statement. This team will lead a K-12 effort to improve students’ digital literacy skills. SchoolPower Endowment also committed $25,000 to this effort. SchoolPower President Kristin Winter set the stage for the night’s purpose. “It shows that you understand that community support is the way we set Laguna Beach public schools apart,” she said..
Organizers Sarah Durand, Carol Moss and Gorjana Reidel received warm applause for their efforts organizing dining, dancing and auction items for bidding.